Welcome to the twilight zone! 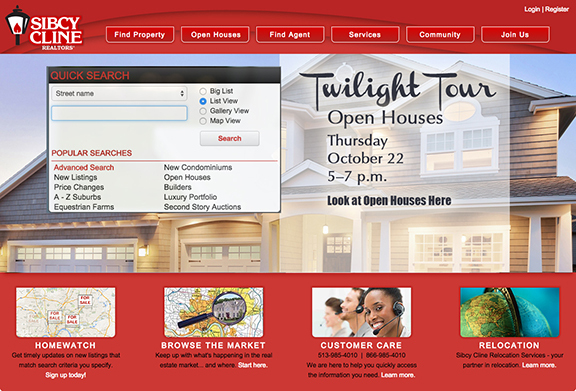 Sibcy Cline Realtors is hosting a Twilight Open House Tour tonight on Thursday, October 22, 2015. Buyers can tour open homes from 5pm-7pm. We have over 70 homes open! Homes in the early evening have that magical appeal with gentle, twinkling lights shimmering from windows. It’s a perfect time for buyers to see a home for sale with all of its features. And, a Thursday evening is a perfect time for those who typically have hectic, time-filled weekends. Super Open House Weekend, Too! Sibcy Cline’s agents are also going to host a Super Open House weekend on October 24 and 25, 2015. This is a Bengals “bye” weekend. See more here. This entry was posted in Buying A Home, Events, News, Real Estate, Selling A Home and tagged 2015, open house, Sibcy Cline Twilight Open House Tour October 22 by susanaknabe. Bookmark the permalink.